A few weeks ago, I attended a network meeting with a group of concerned citizens in a suburb to Stockholm. The name of the suburb is Knifetown, translated to English. Here, I met a man who had the highly sensitive mission of being part of a group of citizens who were complaining about abuse in the authorities where he himself was working. The things he said were difficult to listen to. Sitting a few meters from a person of this capacity was emotional. His background was impressive in numbers – working for the airforce as a pilot and at the office, manager in several positions, he had been accepted for a six year long mission in the US with a so called ”fribrev” from the Swedish government meaning as I understand that he has immunity. He had been working with ”educational issues” on a governmental level, producing educational handouts to social services and the like. He knew exactly that medical experiments are conducted without consent on citizens and the trade with organs. He was now retired but engaged as a guardian and part of the Guardians Association, and working with custody court issues for families. That sounds reassuring. But somehow, in this context, it was not reassuring at all. It was horrible. I told him that there has been medical brain experiments conducted on the boy. And he mentioned a term for that crime, ”Illegal exploitation.” He was completely neutral. Not one sign of emotion or distress. Just a matter of fact. Remember his smile when he spoke about the organ trades and medical experiments. The man continues and says: ”All authorities did the right thing. Oh yes. Because in Sweden, nobody has the perspective across the authorities. So even if staff handles his/her part of the case completely correct, this is the result. Everyone did the correct thing. Nobody did wrong. Still, medical brain experiments have been conducted. And a lot more, too. I tell the crowd that the abuse of authorities in Sweden is in fact a security- and defence issue. Some people representing a political party looked at the man with slight surprise and was met with another – smile. These people are intentionally abusing citizens in the most horrible way using authorities and public offices. They lie to politicans, or simply blackmail and bribe politicians to allow it. Innocent and capable people are assigned a guardian. Children are taken by corrupt social services and corrupt courts. Custody court cases go wild with slandering and accusations of fake mental illness and the psychiatrists in Sweden are completely without integrity so the accused parent will never find someone to issue a health confirmation. All this abuse is also a part of the silent and covered up war in Sweden, Europe and in USA. Victims are referred to as ”jews” by these psychopaths in our authorities. Abused citizens in Sweden normally blame themselves. The propaganda from the Swedish state is so heavy, pushing the word ”trust” down peoples throats. And the gullible Swedes believe them. The gullible NGO:s believe them – and protect their sponsors. Victims believe ”it’s my fault. The state is right.”. Someone told me about a German expression in these issues: ”Dumme Schweden”. In some cases, abused victims seem to be exposed to this state crime intentionally. Just to show them what it feels like. So they can report. So they can engage and help others. So they can protest and revolt against the establishment. Some of these abused people who are talented with guts gather in networks such as the one in Knifetown. They try to understand (very Swedish to deal with crimes and abuse this way. Swedes bend over and that’s why Swedes have very sore rears). The abuse. The betrayals. The complete lack of civil law. And then, listening to the politicians in media saying that Sweden is a ”humanitarian superpower” and ”a role model for rule of law”. The few who still have brains left, become angry. Come on, that situation in Knifetown municipality with the hot dog-salesperson felt like a planned set up from start to finish. It was planned since long ago. “Du gamla, du fria”, artist Mattias Norström. Photo: Matilda Rahm. Kulturhuset 2017. No Sugar. Because You Are Not Supposed To Feel Good. And you would expect secret service, Police and defence to react. To protect the country against abuse. To protect freedom of speech, freedom of press. But, hey, they are a part of this. Especially the secret service and the defence. They like to push victims a little extra. They don’t try to save you. They are fascists themselves. That’s why they allow Transportstyrelsen to happen, and then leak the documentation to embarrass politicians instead of admitting they were part of the problem. 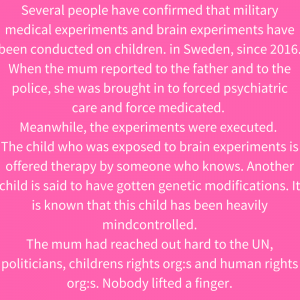 The secret service and defence happily accept military medical experiments on children. A lot of states have been planning to groom and recruit the children, instead of doing everything they can to save the minors. They don’t care if mothers are exposed to electronic harrassment, are tortured, blocked from sleep and heavily drugged with food poisoning in their homes. Instead, they take a seat next to journalists and silence media when mothers visit the editor’s cafees to give media her face to judge for themselves. Because these people have an agenda. That’s not to protect democracy and rule of law, if you are still naive enough to believe that. Does this attitude make you feel uncomfortable? Oh, goodness, poor little baby. Well, I am not here to make you feel good. There’s no way I will sugar this. Not after all these years and all this horrendous abuse that all of you allowed. I get it. Politicians are bribed and sell out their citizens like we’re a package of milk. But you would expect secret services and defence to protect the people and the country and to stop politicians from selling out and abusing our national jewels, staff working in clandestine operations or engaging in corruption. Oh no. They smile. Saying that ”everyone did the right thing in their own box. Oh, look at the result.” That’s what they said in Transportstyrelsen as well. That’s a completely new take on the word Responsibility. Accountability. I’ve had it with corruption. I’ve had it with sick secret services and defence. I’ve had it with foreign states being allowed to harrass and abuse Swedish women, innocent children and men too for that matter. I’ve had it with ”Dumme Schweden”, being easily fooled and mindcontrolled. I’ve had it with so called state secrets because all they do is cover up state financed crime, fraud and corruption that is never allowed to be investigated. The man in Knifetown talked about corruption and horrible abuse which compares to Mengeles experiments, but consistently used words describing the contrary. You allow yourselves to be fooled by beautiful words. That makes life easy and comfortable. These military experiments have been conducted by the USA mainly. The US staff in their jeeps surrounding the mother before and after the experiments were high with euforia. This was something very special to them. To abuse innocent Swedish children, and nobody stopping them. 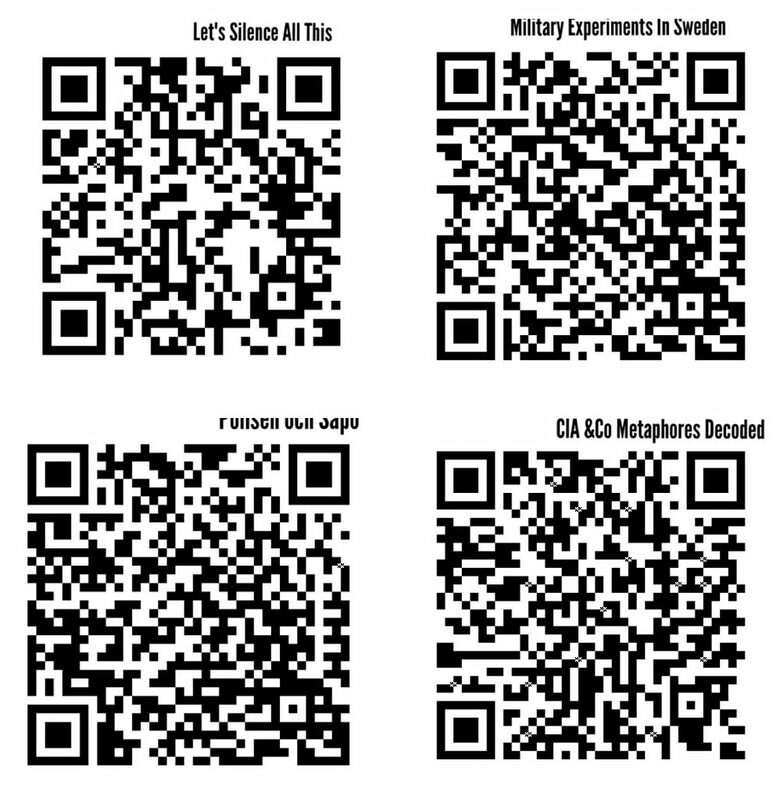 When I posted that the US in fact did all these experiments, my internet has become full of search results and texts saying that I am exposed to psyops and that this is false. My blog post about psyops-strategies have become cluttered with comments. That is US psyops to deny. That will never work on me. I have had my fair share of the US brain experimentation and I have gotten enough evidence to point out who did it. I have also heard comments from children, directly relating to pro-US metaphores that the children themselves do not really understand. What about after a scout camp, a boy says that he was taught that the flower ”björnloka” (bear flower translated to English) stings bad and for some reason he is very emotional about it. And he suggest that an adult should eat ”potatoe”. Do not ever, ever try to deny me. Reality Is Called A Psychosis. Truth Is Referred To As False. When she reported potential abuse to the police and the father to stop the exeperiments, she was instantly taken to forced psychiatric care. She appealed and met several third party psychiatrists in the so called court. They understood that this type of crime is in Sweden considered as a mental illness as it is so uncomfortable. These third-party psychiatrists systematically picked out the worst parts of her dossier – usually words she had reported to the father as his comments were filed in the dossier as the truth. The psychiatrists commented these incidents and asked the mother ”Do you really believe this?” trying to make her withdraw in order to be released from the asylum. One of them had some empathy and professional ethics left. He could not look her in the eyes. He was ashamed and very emotional when he tried to make her withdraw her story and blushed, at least adding that its highly important that the mother is allowed to see her children. This is torture. This is state financed torture. This is the artwork of the CIA, Pentagon, FBI and also other states such as Russia. I know, because I have met them and watched their happy faces. I have seen China in this issue as well. Mention one country that wasn’t involved – it’s the dark side of globalism and international influence. To a great extent it is false information to arrange a situation. You can’t blame those who were given false information and then backed out. You see, I have been around quite a lot. I have met a lot of people –on an international scale. More than I was supposed to. I did this because I was forced to investigate the crimes I have been exposed to myself. I was forced to try to stop the horrendous abuse on my family by myself. And this is what I found. Foreign states influence the Swedish secret service, and control the defence and politicians as well. The Swedish politicians are so caught up in this fake neutrality mess that they quickly betray their own citizens if it makes superpowers happy. A true neutral country has to be able to defend themselves and their citizens with correct analysis, information and if needed, stronger tools. Or they are not neutral but a colony run by someone else. This situation, our situation, has been planned for about 40 years. It could easily have been handled with correct information and analysis early on. The explicit devilishness of picking the worst parts of the mother’s dossier, trying to pretend that truth is false and reality a psychosis, is hard to understand for a person with a normal emotional life. But this is what they do in Sweden and in Swedish psychiatric asylums. The mother was then forced back to the ward where they prescribed medication with forced injections or 6 Risperdal per day in room no 2:1 or similar. This can only be done by psychopaths. The fact that they have succeeded to enforce all psychiatrists and authorities to run their agendas is not amazing. It’s horrifying. You lack the imagination to understand what psychopaths are capable of. In the fall of 2017, the mother visit seminars and speak to people who were obviously part of these alliances. Some of them had met during studies at Försvarets Tolkskola years ago. They were quoting information they had been given, however they did not really understand the meaning of it. They said that ”children must be influenced early on.” And that ”Germany does not appreciate modern methods, they are oldfashioned”. They added that some people just had to be sacrificed along the way, like collateral damage. One of them smiled and talked about getting a new car. He intended to buy a Volvo. If you know the meaning of car brands, you get it. It’s a separate blog post. Mother understood. And she tried to explain the meaning of what they just said. She has been referred to as collateral damage herself. Because they were done with her. In January 2018, the mother meets another person with information about her case. He/she brings it up spontaneously, offering therapy to the child being exposed to brain experiments. The mother has been trying to protect her children. Instead, the Swedish government and authorities has taken her children to enable abuse. They were not put in safety together, as in another country. Mother did all she could to protect her children. Instead, she was met with funeral cars when she tried to visit her children after school already in 2014-15, and lost custody based on false and loose claims in court early on in 2015. She is not legally even allowed to see her children, and vice versa as the children’s perspective outrule the parent’s. Instead, these fascists – also found in the ecofascist alliances – have been demanding that she partner with a man, as a condition to see her children. They came up with that idea already long ago. It’s a sure way to secure abuse and silence by using mind control of a partner. Hey, these people control everything. Watch Grotesco ”Ladies Night” on Swedish national Television and you get the point. This is Sweden. And if you are looking for signs of psychopathic devils in public offices and among politicians, you need to look no further. This is also the USA, and the EU. Never underestimate the power, the reach and the financial power of the US. ”Who rules the world? !” as some tweets put it in triumph. In my judgment, that tweet came from the FBI. The mother is herself exposed to experiments. They control parts of her emotional life. She can’t cry for instance. She hasn’t even been able to cry over her children for about 3 years. She was surprised to note that she cried in two occasions though. First, when she visited the Catholic Church Maria Maggiore in Rome. The beauty of the art was amazing. But the sudden coincidence in the folder about the Maria Maggiore startled her – it noted that ”if you are among persons who cry over religious beauty, you will…” The second time she cried was at a Christmas Concert in a Catholic church in Stockholm. Of course you don’t believe that this is possible. Note the alliances again. Please, will you? Look that up. There are many things you are never told. There are many things that are covered up. And you sacrifice our children. Everybody Allow It. Even Children’s Rights Organizations. Swedish authorities and politicians allow all this. Although they are informed. 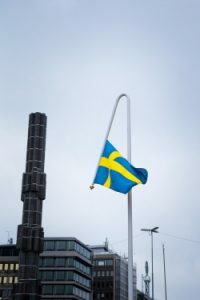 Organizations such as Save The Children, UNICEF, Amnesty, Civil Rights Defenders and Human Rights Watch are all silent, as well as local children’s rights organizations in Sweden. In case they reply to mother’s emails and phone calls, they simply state that they don’t work with indvidual cases. In several cases, they are influenced not to interfere by the defence or the secret service. Oh, hm. They fail to do their own mission. Because of what criminals say. You know, secret services and military have never been known as human rights activists. That should be the ABC of any NGO. The mother got a ”Christmas present” and an ”Easter present” from Swedish secret service in 2017 and 2018. The ”nice” part of the present: They turned the children on and had them reply to some of mothers text messages. In some phrases, she doesn’t even recognize the tone of her children. Then after holidays, they turn the children off again. No replys to text messages. This is mindcontrol. Explicit mindcontrol. This is so cruel that it’s beyond words. But you allow it. For about a year or so, my iPad has been showing me banners for UNICEF. Someone also keeps sending me post from UNICEF since a year. UNICEF suddenly had a stand in my shopping mall in the fall of 2017. For some reason they changed the location after a few months, so it was located right by the entrance I use. Oh, wow. That’s a lot of UNICEF for one person. It’s supposed to look as if they protect my children in this sick political mess. What a giant fraud and betrayal to the world and the children of the world. 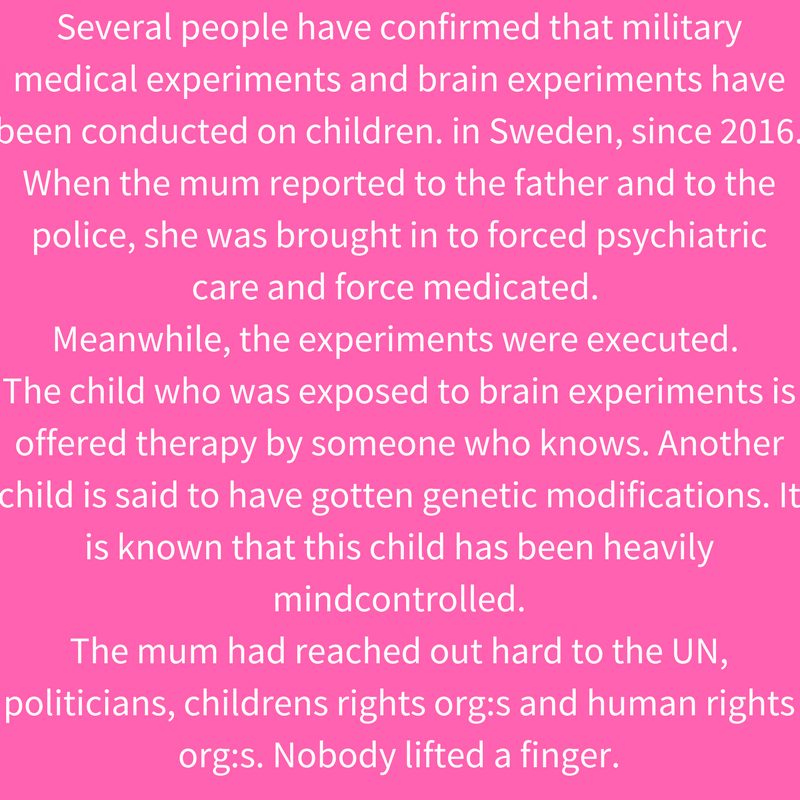 UNICEF are either bribed of infiltrated by the defence and secret services, allowing crimes such as mindcontrol of minors. And more. It is extremely obvious. I have seen that in several children, and spoken to at least three or four different families since fall. They do not understand what’s going on with their children. Their children act differently and strange comments comes from their mouths such as referring to ”a spy”. Parents become uneasy. This happens to children from other countries as well. Some children isolate hemselves, several suddenly refuse going to school for no obvious reason. They stay home for weeks. I have seen plenty of people under mindcontrol. They turn inward, as if they are listening for guidance instead of being focused on the person they are talking to. Some have been very tired, because heavy mindcontrol can be very tiring and intense. This is the worst crime of all. And you allow it. To be a children’s right’s or human right’s advocate and actually believing that adults and children are protected just because authorities ”say so”, is incredibly naive. The secret service guy living above me keeps emphasizing that I am wrong and that they are right when I type this. He keeps trying to make me believe that all this is a psychosis. He uses sounds to communicate. Very, very annoying, but what the hell, then I know the lies and the desinfo they are giving to you. Secret service are fat liers. Abusive, sadistic liers. And they are paid for it by the state. Imagine that. These people are a mafia, and that connection is for real since many years. They never obeyed any rules. Do you really think they would follow yours? When they have their own agenda with children with a sought after DNA? Come on. No sugar. That’s stupid as hell. And you sacrificed my children. All of you. All of you had an agenda. Comment: A couple of weeks ago, I published a shorter version of this as a post on Instagram and here on my web although in Swedish. It’s a text which is difficult to work with but I realized it’s important to translate it to English. So, this is it (above). This blog post is an excerpt from an email sent to organizations, media, politicians and NGO:s. I have filed police reports, published press releases on My Newsdesk since 2014, I have been trying to reach out on social with pings and hashtags, emailed the Swedish secret service and the Defence HQ.